Programs Stories on the Water PechaKucha Your Program? Cost: $275 (cash or check only) payable the first day of camp. THERE WILL BE NO CAMP FOR ADVENTURE BUILDERS ON FRIDAY. Location: Marquette, MI. 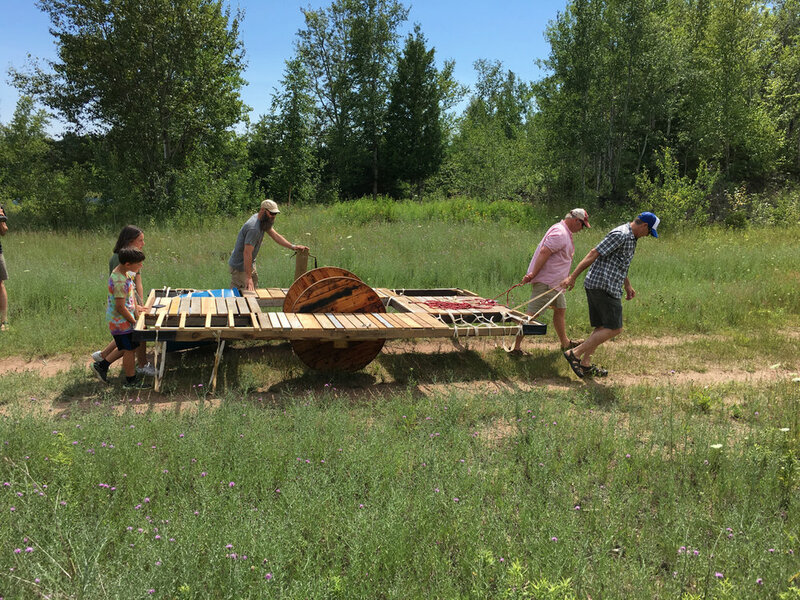 We'll be setting up our workshop in a retired sawmill near The Dead River and North Country Trail. This is a rustic experience and we will be working in a building that is open to the outdoors. Please dress accordingly. Attendees will have access to drinking water and a toilet. Schedule: The general schedule is to work on the adventure building project throughout the day. We take breaks to go berry picking, explore the nearby sandpit, catch crayfish in the river, bike the nearby trails, and of course, swim in the nearby Dead River. We usually set a rough schedule every morning and adapt it as the day, project focus, and weather permit. Food: Adventure Builders should bring a lunch and snacks with them each day. We will take a snack break mid-morning, and eat lunch around noon. Adventure Building: The goal is to build something AWESOME, as my friend Dustin would say, "Just for the glory of it." Kids are given an adventure protocol to ponder and they build a structure/ vehicle/thing and we (the staff) do our best to support kids in making it all happen. The basic idea is this: build something incredible with a group of new friends and then take it out for a test drive (that's the adventure part!). Examples of adventure building projects include: boats, bridges, rafts, forts and wheeled human-powered vehicles. 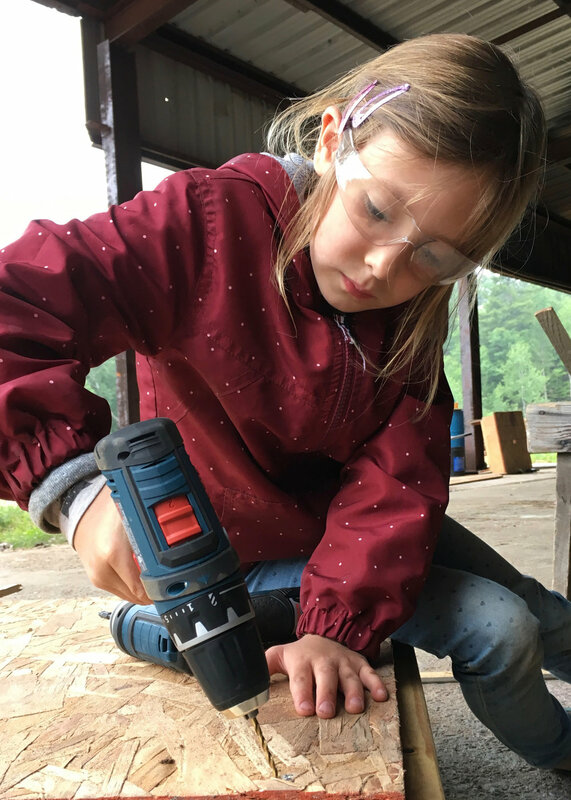 How Kids Learn to use Tools: At the beginning of Camp we do a workshop overview which includes basic information about our tools, how they work, and how to use them safely. We then support kids one-on-one throughout the week as they naturally get the repeated practice they need to build confidence in using a tool. With an adult ratio of 1-4, we use this approach to create a culture of safe tool use. We believe this is the best way for kids to learn to use tools safely and confidently. 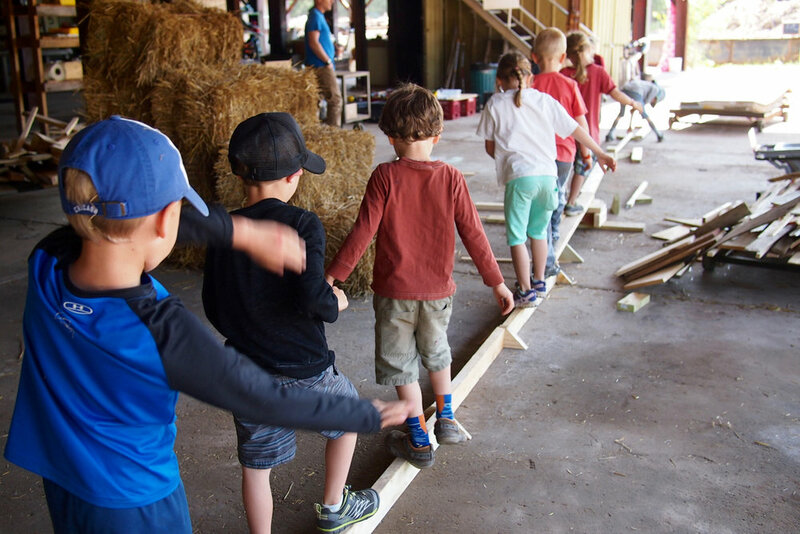 We notice that when kids build and use of tools in social contexts and spend time making things that they care about, the most important thing they build is a sense of confidence in themselves and each other. That’s why we run Adventure Building Camp, to give kids a sense of what they are capable of doing. It’s also why kids return to camp every year. Please wear hard-toed shoes in the morning for use in the workshop. Boots or durable tennis shoes are ideal. Sandals are not protective enough. Crew: builders ages 9-14 with a ratio of 4:1 kids to staff. We seek a diverse, fun-loving, gender and age-balanced camp and staff. Access: Our location is accessible from County Road 550. Please have a look at the map HERE. We will have signage out on the road to help you find the turn-off. Amber Dohrenwend: Splits her time between Marquette, Mi and Tokyo, Japan. For the past 15 years she and her husband have worked at international schools in Taiwan, Egypt, Pakistan and now Japan. She was born in Marquette, but spent most of her childhood growing up on a sheep farm in the northern lower peninsula. When she and her husband moved to Tokyo, Amber gained an interest in the city’s numerous adventure playgrounds, which she frequents with her two young daughters. She also builds grandiose costumes and other cool stuff out of cardboard at The Cardboard Collective. Peter Dohrenwend: Teaches 7th grade science at The American School in Japan. He is a licensed lifeguard, bus driver and was formerly a white-water river guide. He loves nature, cooking and being outside in the elements. Beware of his punny jokes. Bios of Additional staff will be added after registration is confirmed.